It doesn’t take a world crisis to understand that negotiation is a vital part of everyday life. 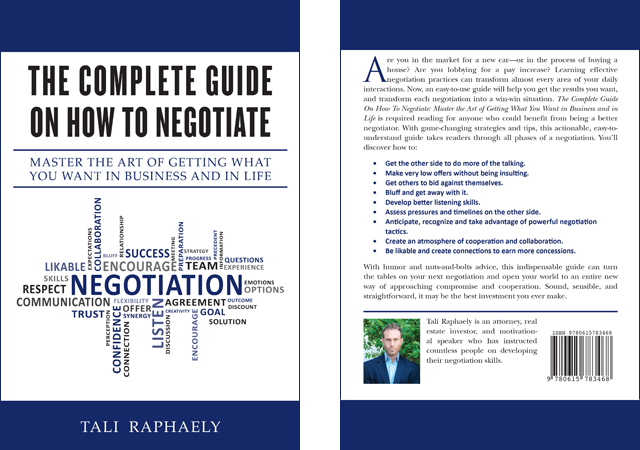 Negotiation occurs in business, non-profit organizations, government and legal proceedings, among nations and in personal situations such as marriage, divorce, parenting, or buying a car. Raphaely, an attorney as well as president and managing member of a national real estate title firm, has built his reputation based on his negotiating skills. He has refined his skills in countless situations – buying income-producing rental properties, buying and selling real estate-based businesses, representing clients in contract, employment, and lease negotiations, and bargaining lease terms with countless tenants and landlords. To many, the mere idea of negotiation is intimidating, either because they are afraid it will turn into a confrontation, or they just don’t think they’re very good at it. But avoiding negotiation, or approaching it with a negative mindset, will invariably lead to shortchanging oneself. On the other hand, viewed correctly, negotiation can vastly improve everybody’s lives along many dimensions – financial, job satisfaction, business success, and personal contentment. Speaking From The Perspective Of The Other Person: To be a skilled negotiator, one has to perceive the negotiation and the complete situation from the other person’s perspective and not one’s own. The better one becomes at seeing things through the eyes of others, the better one will be able to help solve other’s problems and meet their needs. Collaborating: Collaborators are good at using negotiations to understand the concerns and interests of the other parties, and enjoy negotiations that involve solving tough problems in creative ways. Change the perception of the negotiation from a conflict between the parties to a problem or situation the parties are working on together to resolve. Dealing with Deadlines: Deadlines come and go; but learning how to assess a true deadline is essential to negotiating success. Raphaely offers specific pointers on how to ascertain whether the deadline will represent a true end to the opportunity or if there’s a possibility that the deadline can be modified to provide additional time for negotiating and making a final decision. Above all else, it’s important to prevent negotiations from degenerating into an adversarial brawl, with parties attacking each other’s integrity. The best way to do this is to keep a handle on one’s emotions, while empathizing with the other party. “As the deal closes, in the final stages of negotiations it is critical to create an atmosphere of connection and mutual satisfaction while remaining alert for further opportunity,” says Raphaely.